Coaching a complete novice to achieve a handicap of 12 in just 18 months! Greg has also been responsible for designing and delivering many junior coaching programmes in schools and at golf centres across the UK, including a project for the West Bromwich Albion FC’s Community Programme. 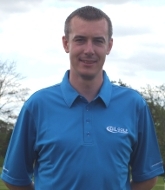 Greg has experience in organising many unique coaching and playing days around the UK, but his most successful trip to date came in February 2012 when he took 16 golfers away to the Montecastillo Golf Resort in Spain to coach for a week. This proved so successful that the trip is now a firm fixture in the diary for many. Greg is a very approachable person who has a versatile and friendly coaching style; he believes this approach has allowed him to improve golfers of all ages, gender and ability. The service you will get in your lesson is 2nd to none. Greg uses the state of the art video analysis equipment at NO EXTRA COST and has a unique function in that you are able to view all of your video capture with audio comments highlighting key points worked at in lesson – you can do all this from the comfort of your own home from you personalised web profile. Greg is available for lessons at Warley Woods Golf Course, which is located just off the Hagley Rd on the border of Birmingham and Sandwell. Please note: 24 hours notice is required for cancellation otherwise full fee is charged. Please click here to see Greg’s upcoming coaching courses.